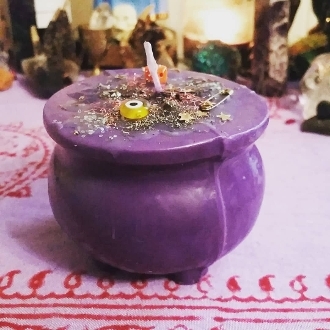 My loaded cauldron candles are 2.5 inches tall and 3 inches wide. Each is loaded with stars, a safety pin, a di, an evil eye, crushed pyrite, my Spell Speed oil, my manifestation blend and more. Cauldrons are a symbol of growth, magic and abundance. They birth food, medicine, spells and brews. A symbol of the Goddess womb. Enhance your spell work and draw all forms of abundance and magic into your space.